The Siberian American: Welcome to the World, Anthony! Welcome to the World, Anthony! Our sweet Anthony Christopher was born on October 20 at 3:46 a.m. He weighed 6 pounds and 15 ounces and was 21 inches long. We are so in love! I was in labor for 24 hours after being diagnosed with severe preeclampsia. We were discharged on Tuesday, October 24, only to rush to the ER five hours later with a 106 degree fever and be diagnosed with a kidney infection. We were finally able to go home on Saturday, October 28. I will share more of the story later, but that's why I have been MIA-soaking in all the adorable newborn cuddles and recovering from all the post-partum problems. We are so thankful for our healthy, adorable baby boy! I'm going to take a little more time off blogging, but I'll be back soon with more stories and photos! 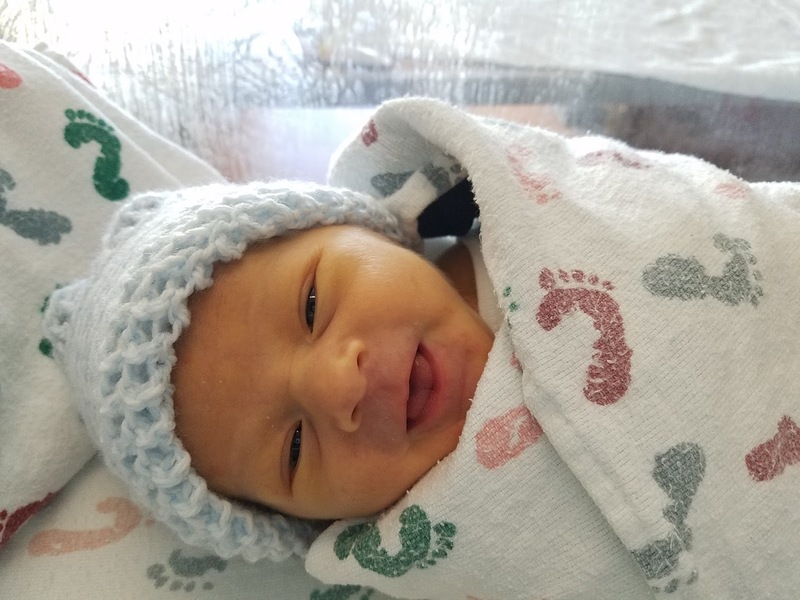 Congratulations- he looks so precious! I can only imagine how scary that must have been, but am so glad you guys are both doing well! Awe! Congratulations, Oyla! So happy fro you and your new family. Hope you feel better soon. Can't wait to hear more about sweet Anthony. CONGRATS! He's adorable! Sorry to hear about the post pregnancy problem but happy you are on the mend! Congrats!! He is seriously precious. Love that cute little smile!! :) So sorry to hear about all the problems - hopefully the rest of recovery isn't so bad. I'm so sorry to hear about the health problems! But thankfully Anthony is here and healthy and it sounds like you're on the mend too. He's perfect. :) SO glad you are okay. I'm sure that was all very overwhelming!! Take care of you and that sweet babe! He’s so incredibly adorable and I’m so happy that you both are healthy now. I️ can’t even imagine how scary that must have been to have to rush back to the hospital, especially after dealing with all of the normal post partum stuff! I️ can’t wait to hear more! He's gorgeous mama! Hope you are feeling better! Congratulations!! Glad you are both doing well now! congrats again! glad you are doing better. he is beautiful! I'm so happy for you guys and so glad Anthony is here and everyone is okay! I'm sorry you ended up ill for a while but I hope you're feeling better now. Congratulations!! He is perfect! How wonderful!